“A long time ago there was a young boy. Growing up he always loved sports but his favourite memory was watching a game played on ice that would forever change his future going forward. Every week, he would sit by the TV watching fascinated at this game in which players zoomed along the ice with sticks to direct a puck into opposing goals. As he grew up he fell in love with the game of hockey and the rest was history. Growing up, he watched a team known as our Vancouver Canucks and absolutely adored them. As a child, I always played ball hockey in my basement, and dreamed of growing up to be a hockey player for the Canucks and scoring the game winning goal in overtime to win the Canucks their first Stanley Cup. 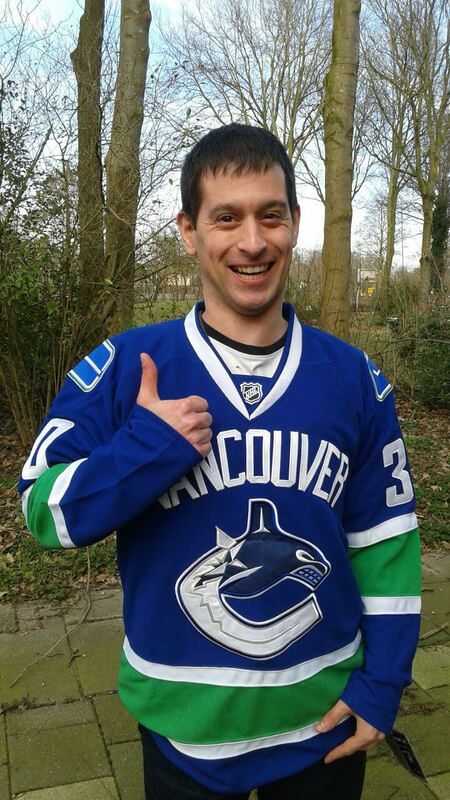 Yes, I know it is unlikely now, BUT it was a childhood dream and even though I might never be an NHL player, I still love my Canucks and the game of hockey. I’ve been a fan for as long as I can remember. Fast forward to today, where my love for the Canucks have grown to more of a diehard fanatic stage and sometimes an obsession. For as long as I can remember the game of hockey has been ingrained in my heart from a young age and no matter what my team is always the Canucks first. My second favourite team is Pittsburgh and before anyone accuses me of being a bandwagoner or how could I have two favourite teams, let me explain. Pittsburgh is my second favourite team because they have had such amazing players who played for them. From the likes of Jagr, Lemeiux, Straka and now Crosby, Malkin and Letang. There’s that reason but the MAIN reason why Pittsburgh is my second favourite team is the Canucks connection of course. I’m talking about the Markus Naslund trade from Pittsburgh to Vancouver that helped Naslund become one of the most beloved Canucks in history today. Anyways for those who haven’t gotten to know me, my name is Justin. I am a diehard Canucks fanatic and although I might never dress up and play for the Canucks, I do have the privilege of currently working for them now in their hospitality division. My dream job would be to work in the Marketing Department for the Canucks, combining my love of social media, marketing and Canucks into one amazing job. I’m known to my fans as the most diehard fan they know, owning lots of Canucks merchandise, jerseys and always talking about the Canucks. I’m always in some sort of Canucks gear, so it’s easy to pick me out from a crowd. As for my thoughts on the team and the upcoming season, I know that win or lose, I’m going to be rooting for my Canucks ALL year long. Everyone says they are in a rebuild and yes its a youth movement direction that we’re going in BUT it doesn’t mean that it won’t be successful. Anything can happen in this crazy game of hockey and it’s just as much about bounces and hard work as it is about skill. My friends always ask why I cheer for the Canucks, year after year when they only disappoint and break my heart. I tell them that it is what the love of my team and the game is all about, being a real fan through the good, bad and ugly times. I know that one day when they persevere to win it all, the journey of being a true fan who always stuck with them will make that cup win sweeter and not just because of one year when they are doing well. There’s lots of favourite memories of mine and every season brings new ones BUT personally my fave so far is winning the Canucks 25th Million Fan twitter contest. I won tickets to the game, got to be interviewed on the scoreboard, had Kevin Bieksa pick my entry and WON Daniel Sedin’s game worn autographed jersey on the ice after the game. It was a dream come true. I know we have a relatively new leadership team in place with Linden, Benning and Desjardins BUT I think they can do an exceptional job with their vision shaping this team to be successful on AND off the ice which is probably why I love this team so much. It’s not really about the wins and losses on the ice but that this team is winners off the ice in the community, always giving back and that is something I truly value and admire about the Canucks. They inspire me to always be a better person when the opportunity arises and even when it doesn’t because it makes the world a better place. I am going to head into this season with no expectations other than for the Canucks to keep doing what they always do. Play hard but win or lose, always represent the front of the jersey with pride on and off the ice. I’ll be rooting all year even if they finish dead last in the league or if they surprise all the naysayers wrong AGAIN and go on a playoff run. They sure surprised people last year. No one expected them to compete for a playoff spot but they finished with a successful regular season: 2nd in the tough Pacific Division and this was with a rookie and new players on the team with a new leadership team as well. This year anything can happen but no matter what I’m always going to be a loud and proud Canucks fan. My favourite all-time players would have to be Trevor Linden and Pavel Bure because of the the leadership and skill that they played with. Other players I admire include the Sedins for their skill and involvement in the community, Markus Naslund and Alex Burrows because his story of hard work and perseverance to make it to the NHL despite being undrafted always inspires me to never give up on my dreams either. 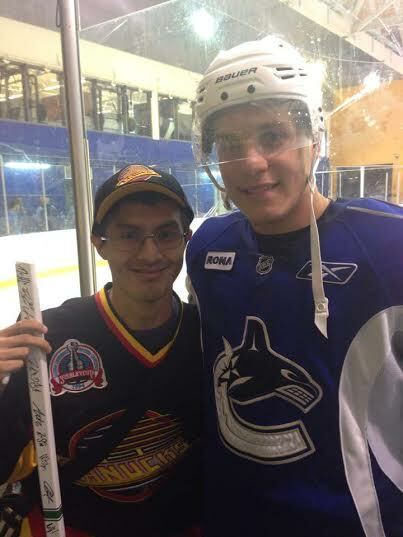 I’m most excited about Bo Horvat as I see him as the future captain after Henrik Sedin calls it a career. 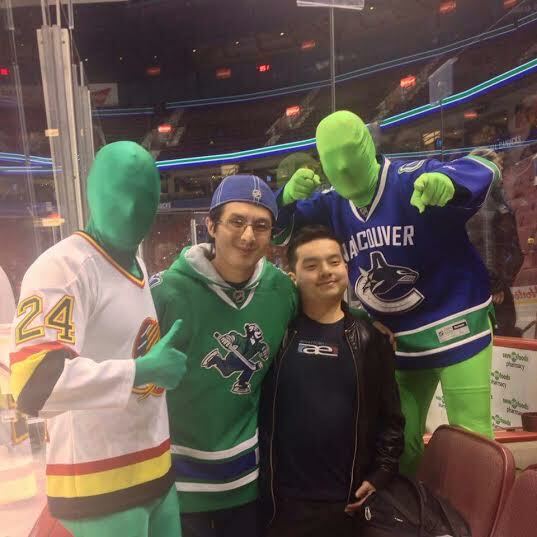 For those who want to connext with this crazy Canucks fan on social media, find me on Facebook and twitter (@justinlai01) and follow my NEW personal Canucks blog I am starting this year on twitter and Facebook (@TheCanucksBuzz). First, thank-you for sharing your story with all of us! 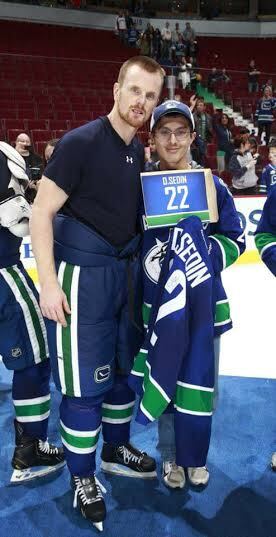 Second, I am totally envious of you meeting Daniel Sedin. I’m 100% with you about supporting the team through the good, the bad and everything in between every year and that the impact the team has goes far beyond the game on the ice. I look forward to hearing more about your upcoming blog and encourage others to also follow along! 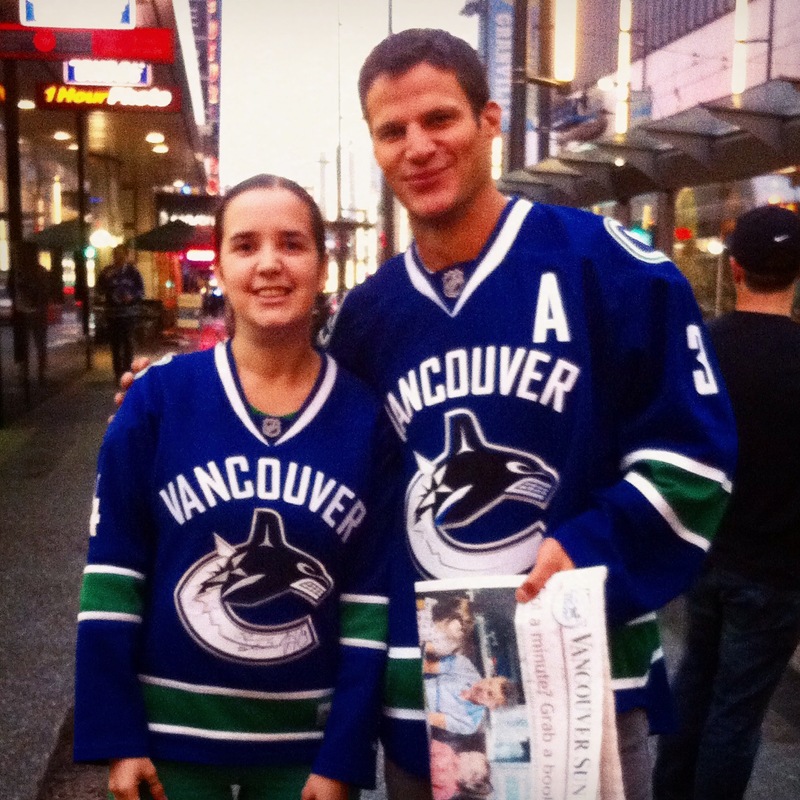 Welcome to the Canucks blogging community!